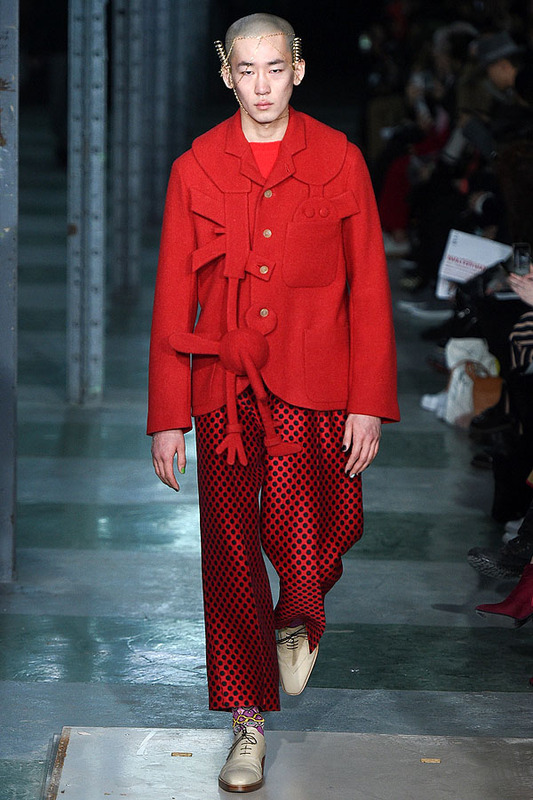 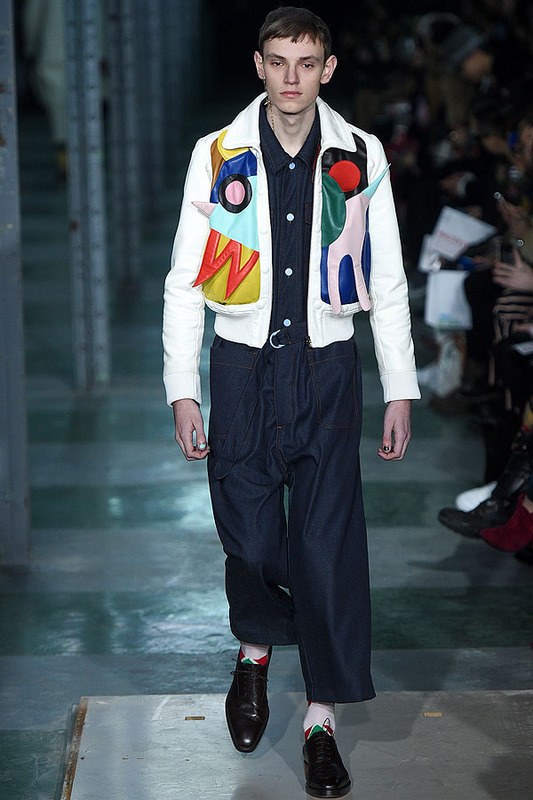 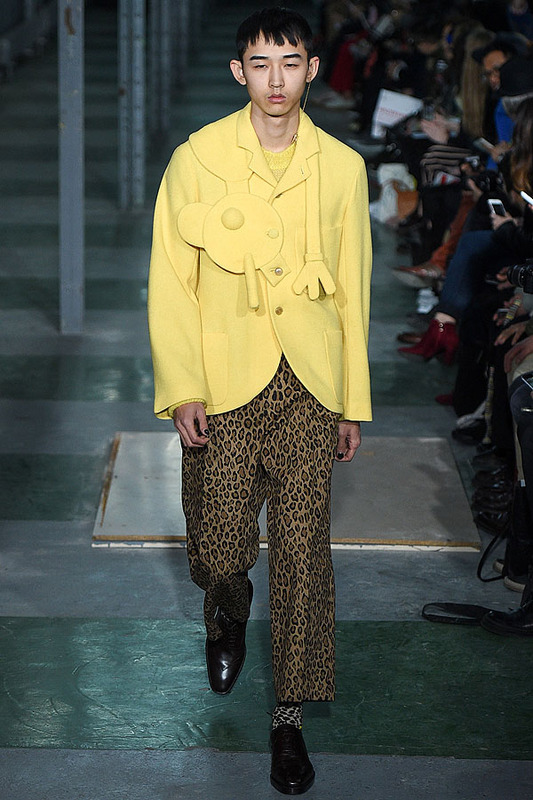 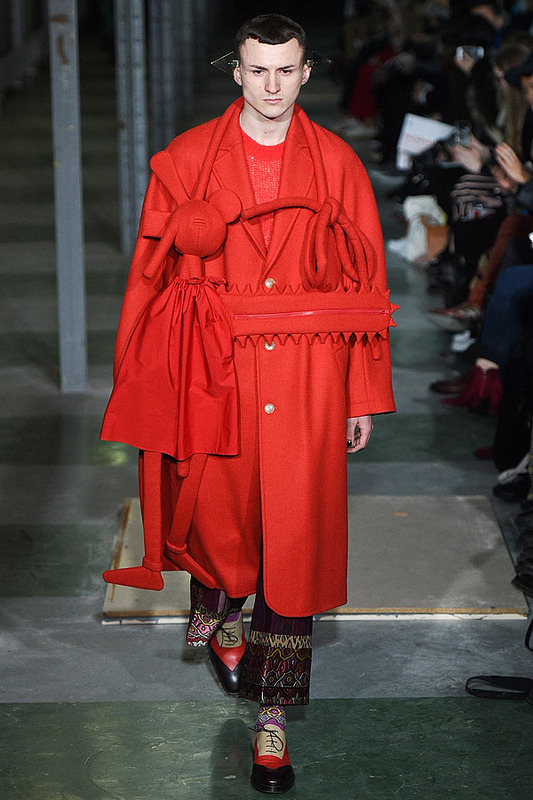 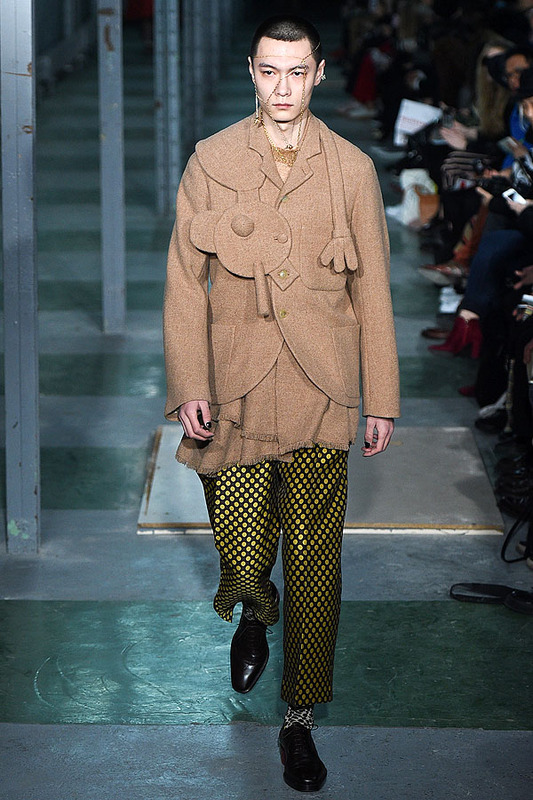 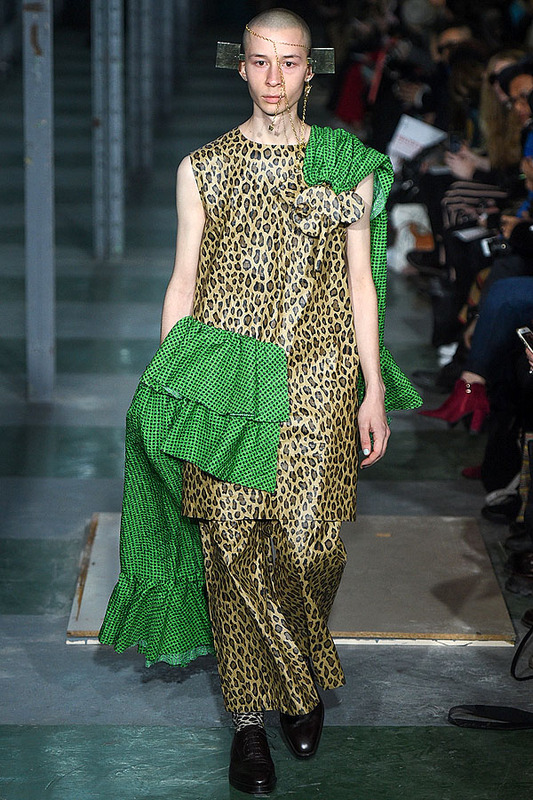 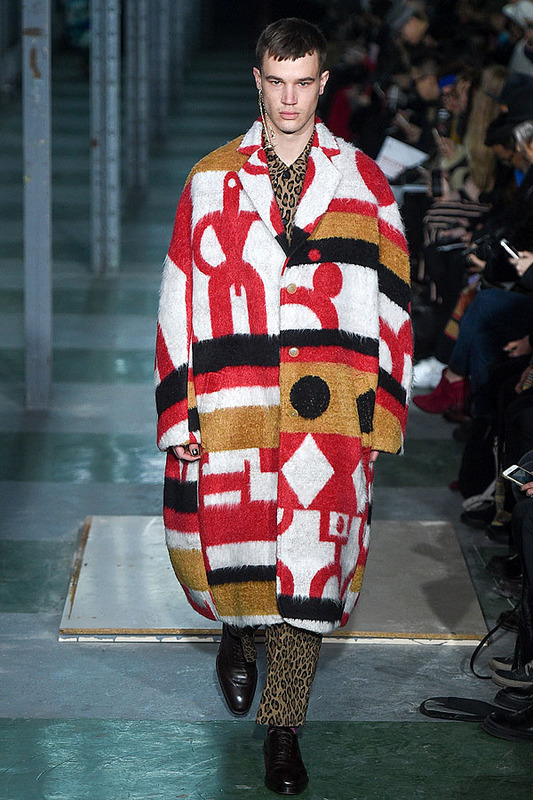 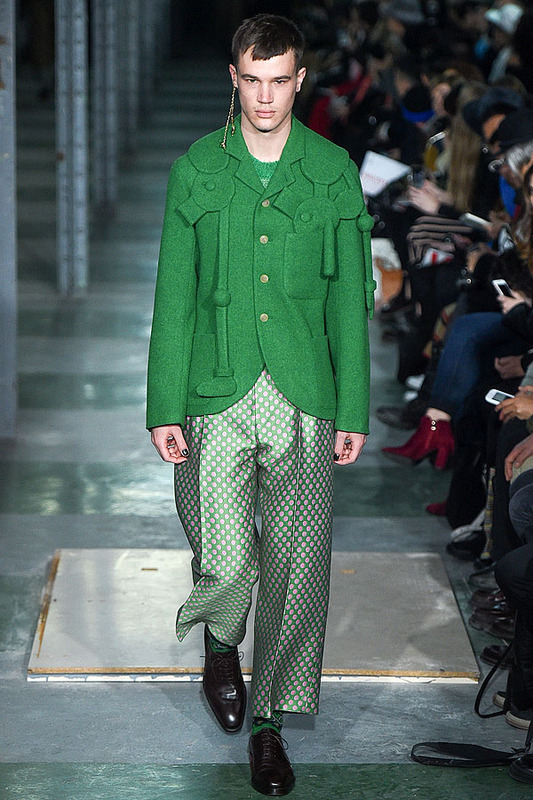 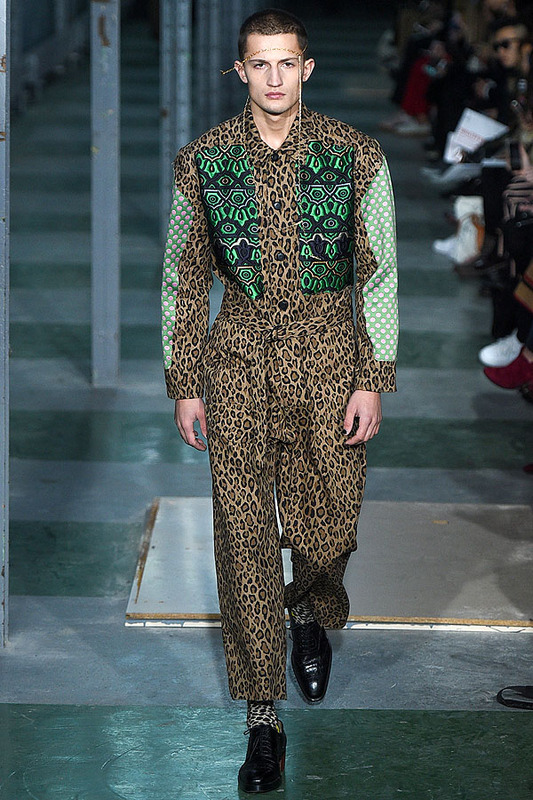 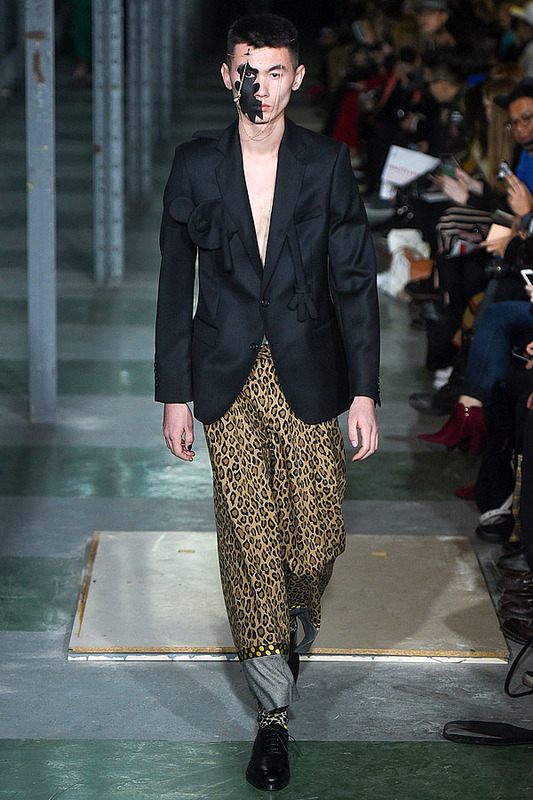 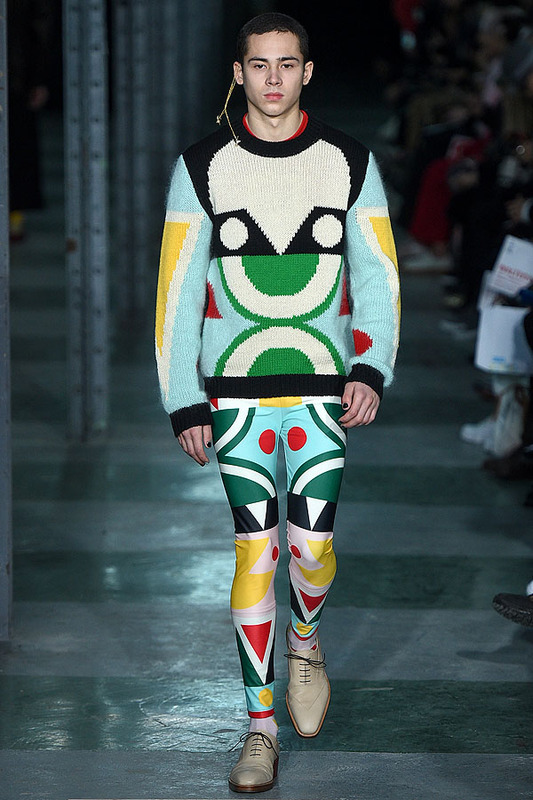 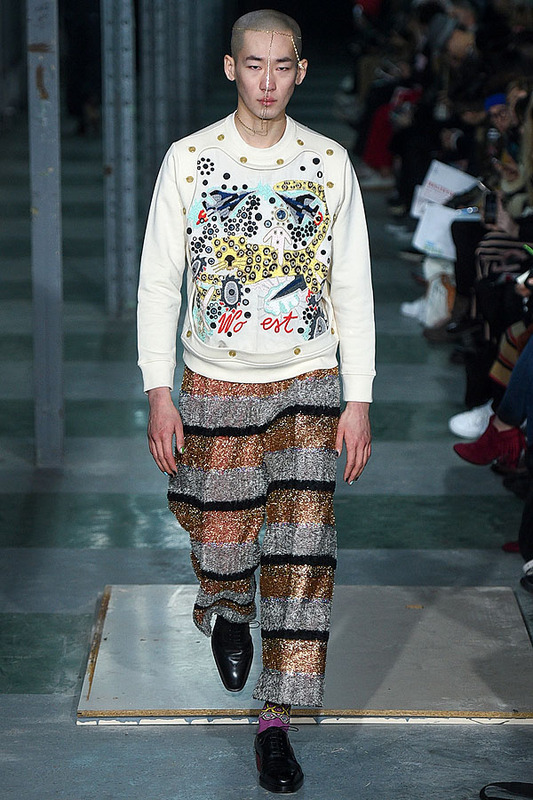 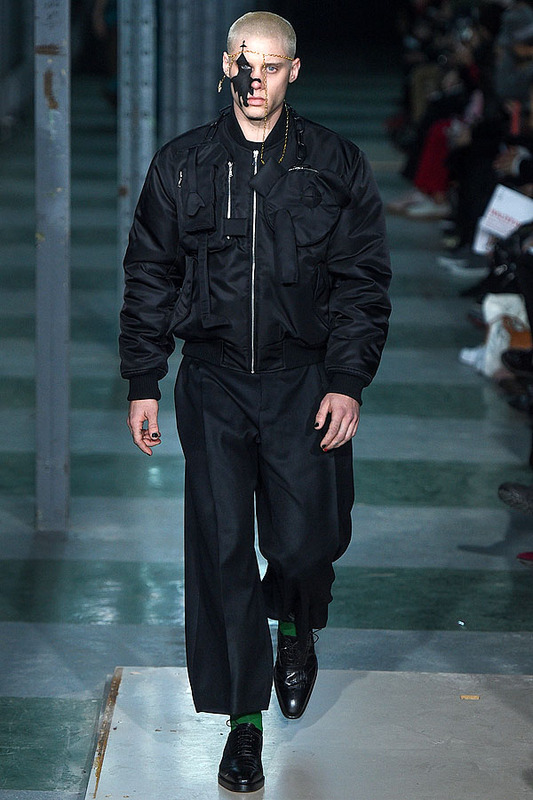 After Walter Van Beirendonck darted down the runway at the end of his terrific fall 2016 show, the booming soundtrack segued into a tender piano version of David Bowie's Life on Mars. 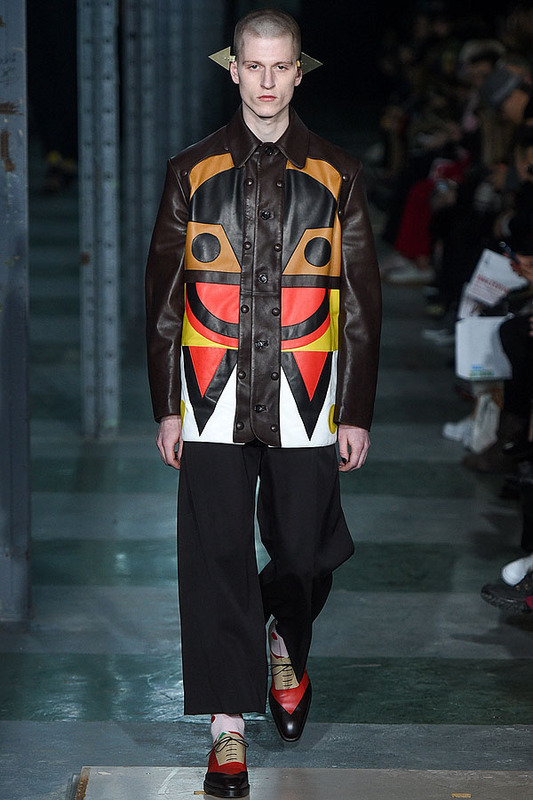 It was a timely and touching reminder of the designer's formative years back in the seventies, when his discovery of the late protean singer left a profound impression of him. 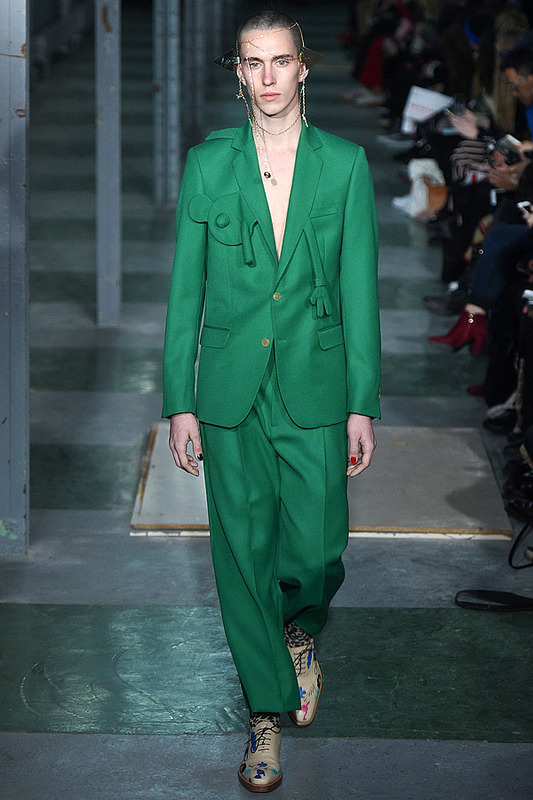 Like Bowie, Van Beirendonck has a transgressive and progressive streak that nothing, not even all these years that have turned his beard into an ashy bush, has dampened. 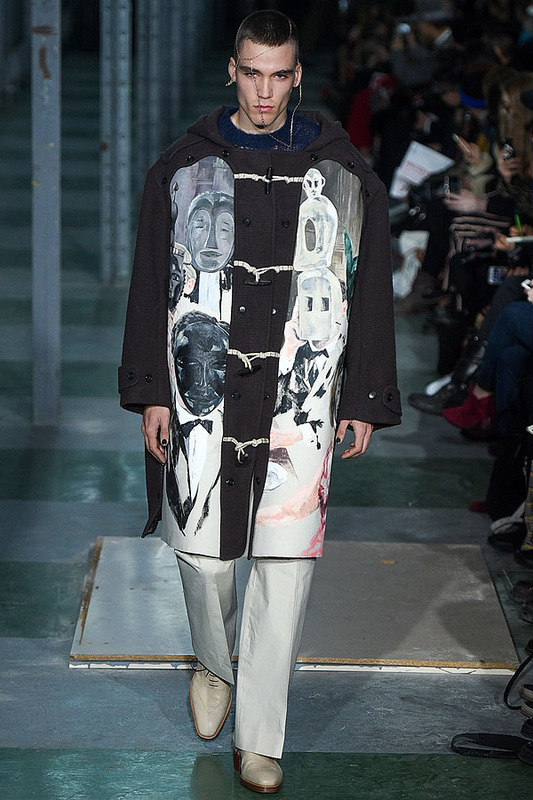 His work could be defined as social commentary wrapped in playful imagery, and this season was no exception. 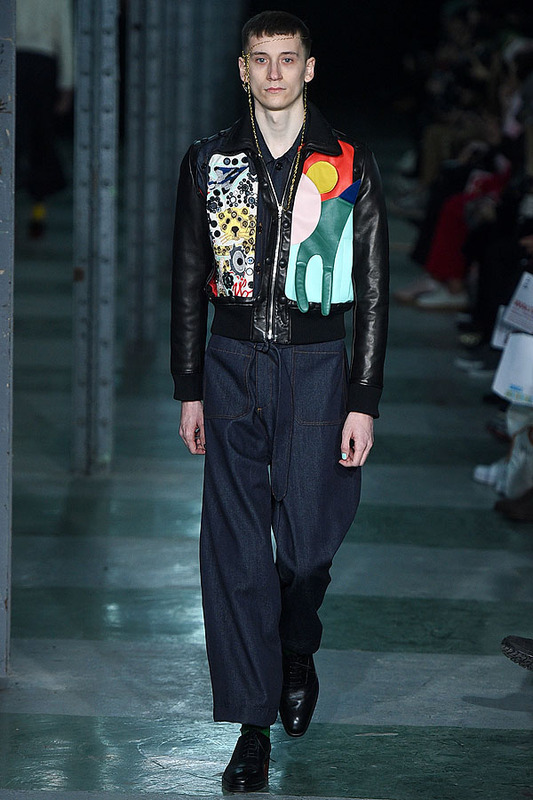 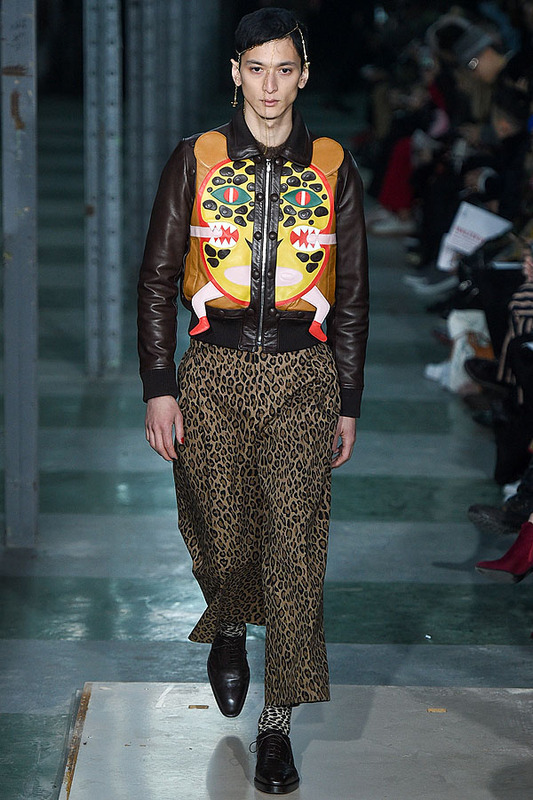 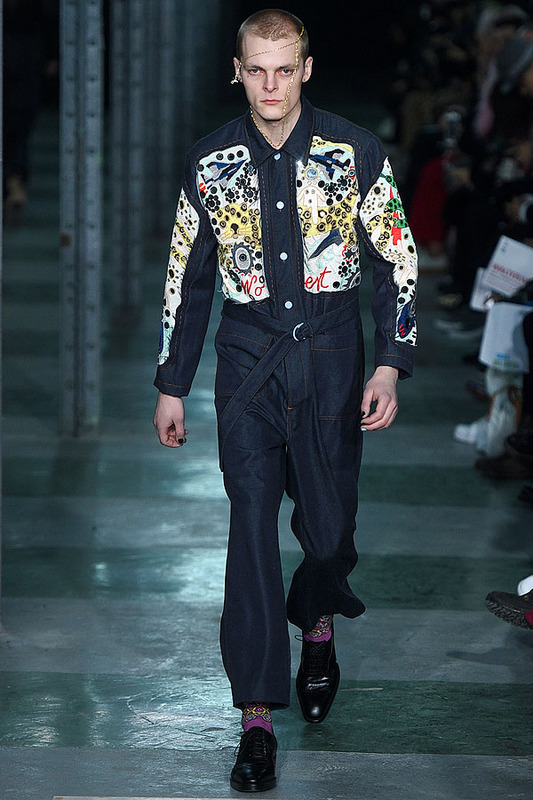 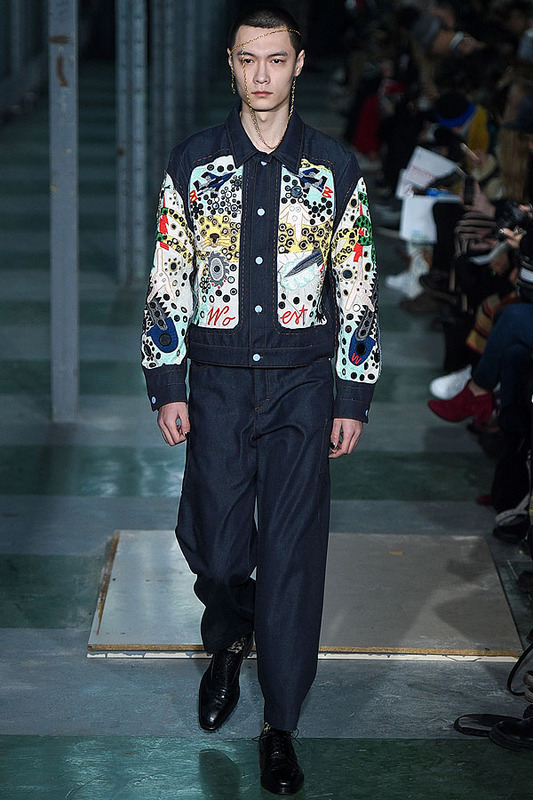 Cheerful jackets with rounded edges sported cartoon-animal appliqués. 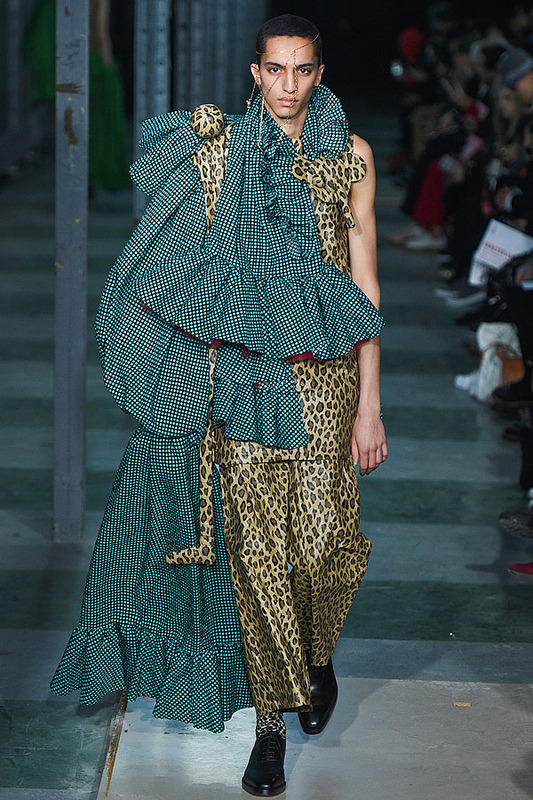 Ruffles sprouted from leopard-print dresses, and tinselly fabrics sporadically surfaced. 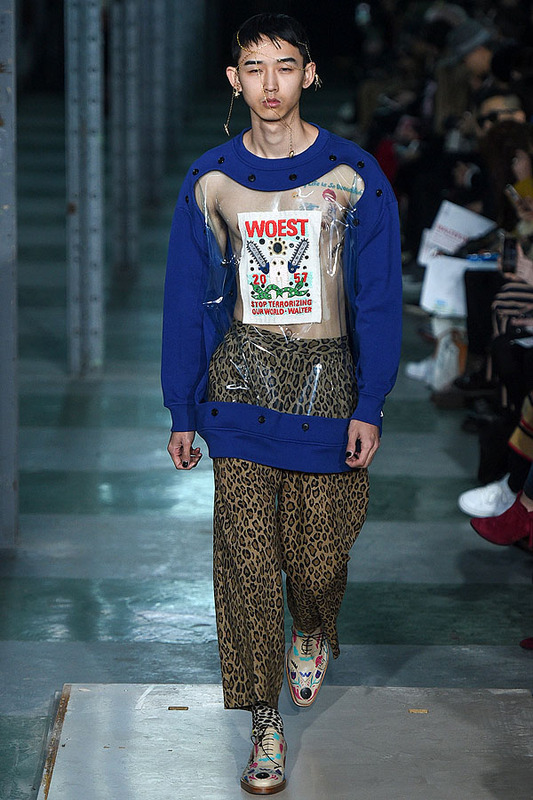 But despite the playfulness, the show's real message revealed itself in the title, Wo est, a Dutch word meaning ferocious. 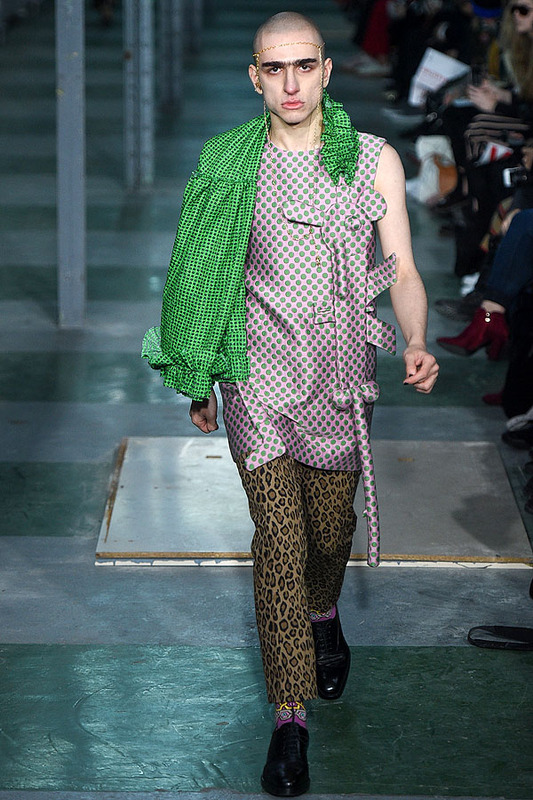 This was his way of expressing his anger at the current state of the world, not unlike two seasons ago, in which one of his models notably wore a see-through shirt that read Stop Terrorising the World. 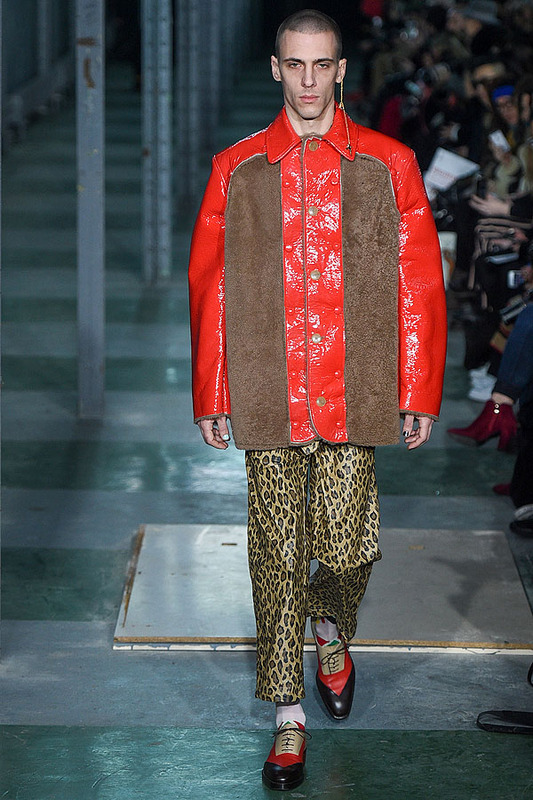 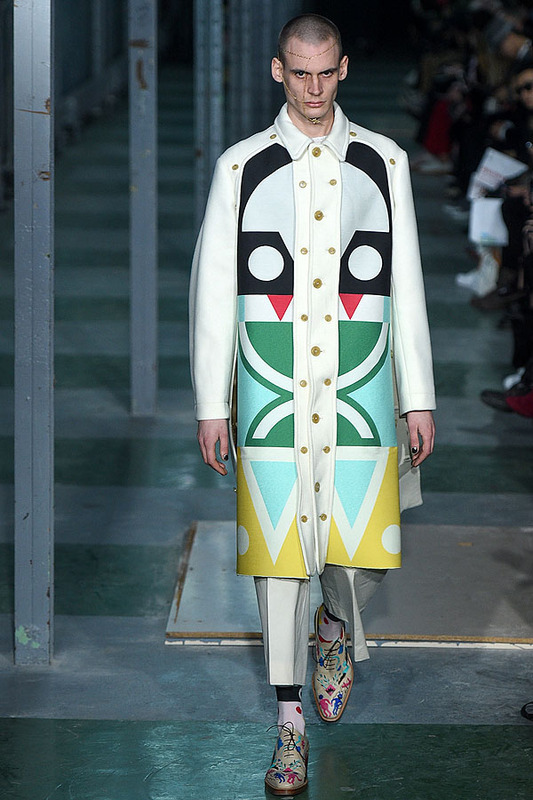 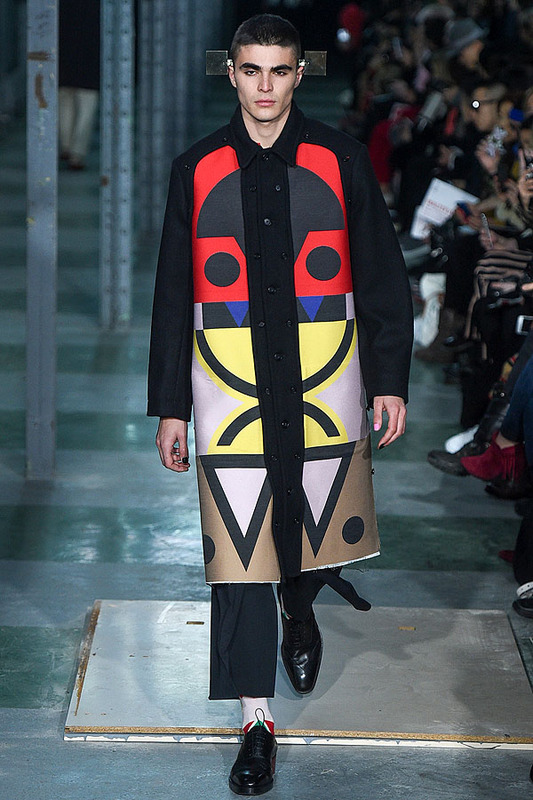 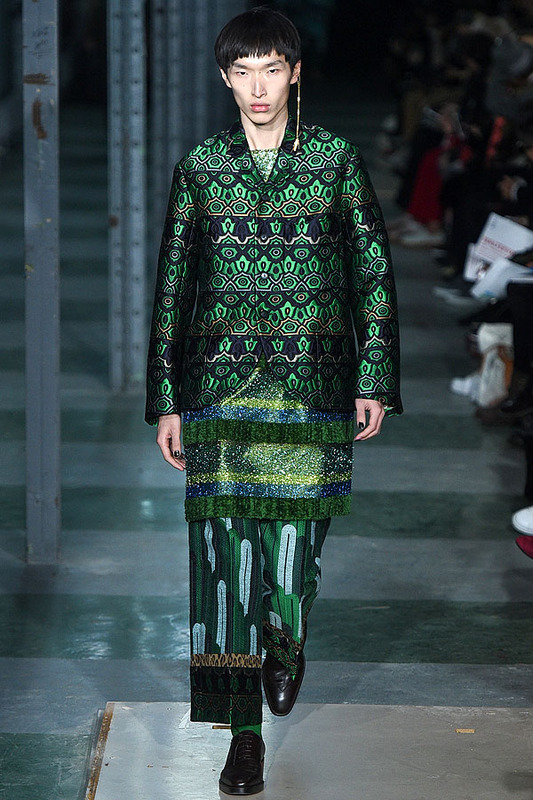 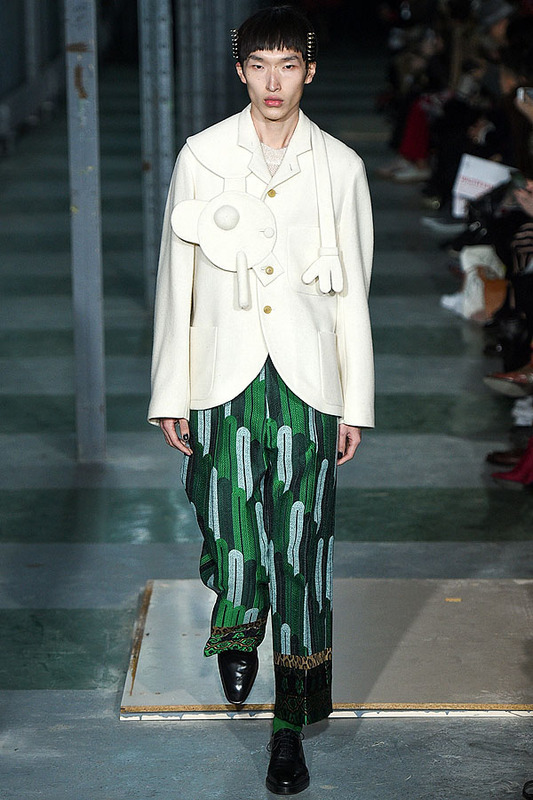 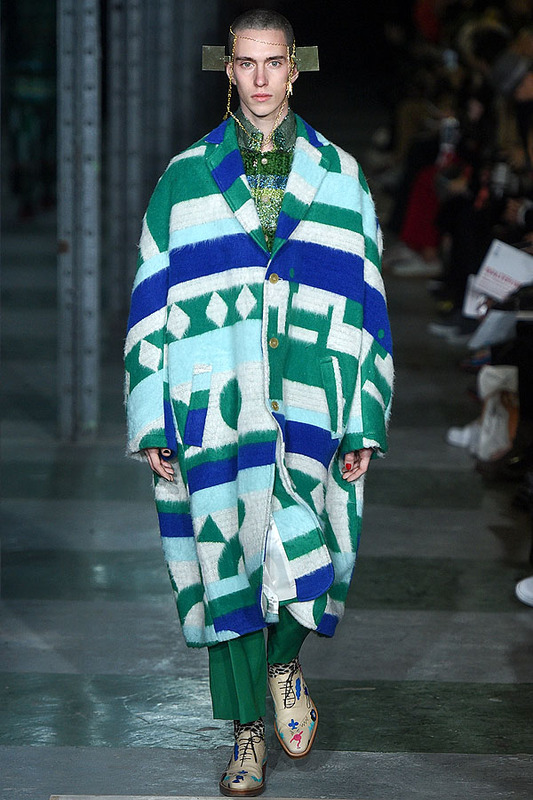 Van Beirendonck's worldly view was also evident in his Batik-like fur coats, the mask patterns on nifty leather jackets or duffle coats, and his use of Asian models, who are currently enjoying a moment in men's fashion. 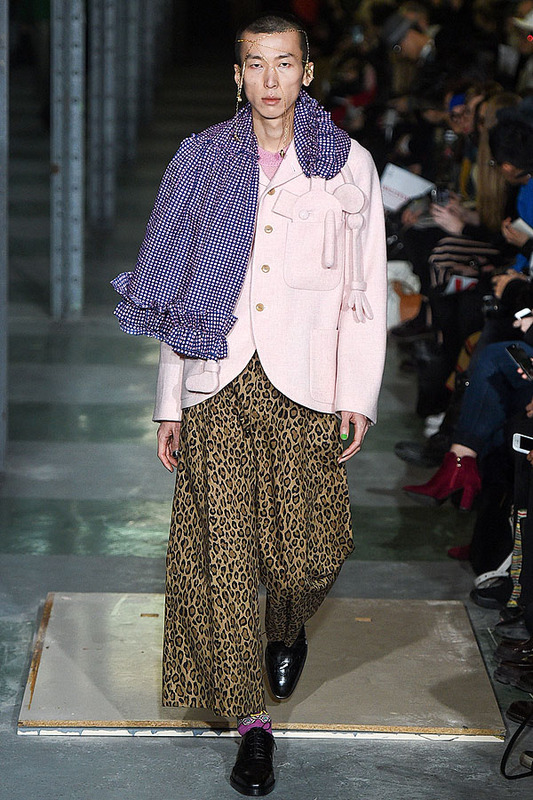 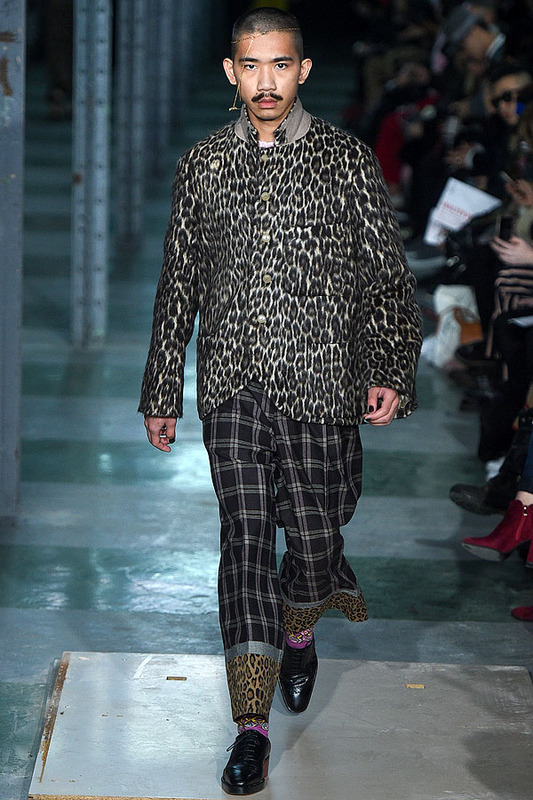 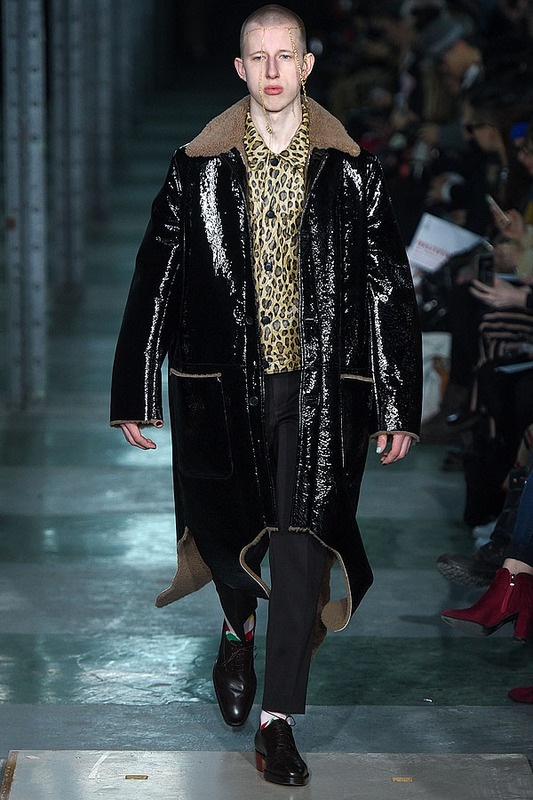 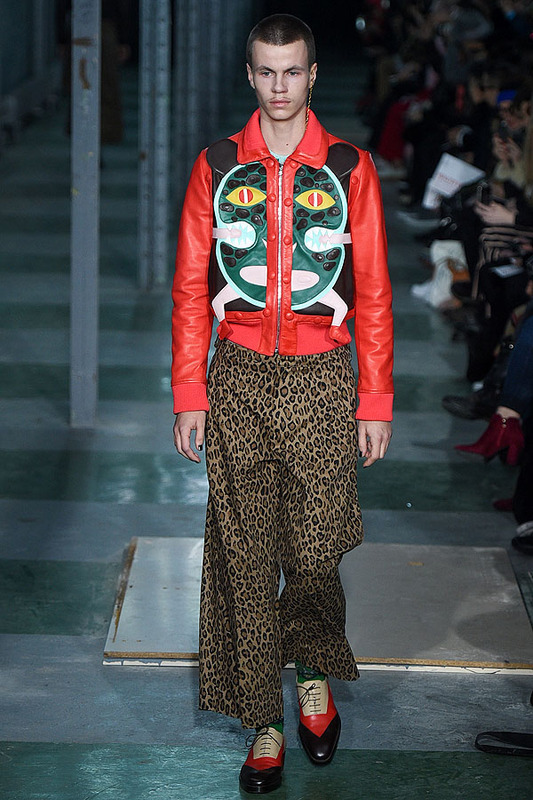 Other highlights included colorful shearling coats with undulating edges, leopard-print kimono-like pants revealing socks in a different leopard pattern, and inventive face jewelry.